"My Success: I could no more describe to you in words the taste of chocolate or the feeling of being in love. And this, too, is impossible to put into words, yet, I have come to know a magical world that responds to me, that pulls me, that dances before me and shows me all manner of truths and I would love to tell you about that. Mostly, because it is so much fun to live with Awareness! It is through my fervent desire to grow and explore what it is to be human and beyond that I found the CoSL. Renee Bledsoe and everyone in the community are remarkable because there is openness and acceptance, understanding and love, and most of all community. And here, there is Intelligence and Divine Creativity. My favorite of all is the study of the Medicine Wheel. A journey in one of Renee's clans is like being on a mystical voyage guided by the wisdom of the Shaman and the trickery of Coyote. Here you can look at yourself, face to face, in naked understanding. It is a raw practice, visceral, moving and life altering. I have opened my mind and heart to see the light and shadow of myself. I am more real. I know myself better and I see that the whole universe supports me in ways I had never known before. It is an ordinary very grand thing. And the little joys of communing with Divinity are so personal, they fade in the telling. Perhaps these threads of thought will express my gratitude in some way. Even now, a tear slips down my cheek, the form, unable to contain the emotions that rise up. When I began this aspect of my journey two and a half years ago, my world had shattered. It was at at this time when I was at the lowest point in my life that I was divinely guided to Church of Spiritual Light; specifically the class, Addiction Alchemy. From the moment I began traveling the Medicine Wheel, my life began to transform. As I became involved with the many other classes that are available through the People Shine Project in this space, my journey of healing and recovery has progressed at an accelerated rate. The programs that are offered here under the People Shine Project are remarkable and I cannot say enough about the amazingly gifted people who volunteer their time and love to make all this happen; including most especially the founder, Renee Bledsoe. Without her love and vision, none of this would be possible. I am also happy to now be a part of the team of people who teach and facilitate through the People Shine Project. Much gratitude to everyone involved in this wonderful program. "Words cannot express the deep gratitude that I have for the miracle of what has evolved through the People Shine Project. This project is something that truly emerged out of the deepest desire to align with those of like mind, which brought forward an array of gifted teachers, coaches, ministers, therapists and artists to help others to heal, grow and be inspired to hope and dream for a better life. This group is truly on the cutting edge, not simply coming together to heal wounds, but coming together to heal THROUGH those wounds, and through the power of this amazing mastermind of positive re-enforcement go way beyond healing into realms that could not have been predicted. I often hear, I discovered a hidden talent or I'll watch someone emerging as a leader and then confidently and quietly take on more responsibility. But above all, I believe that this group is very special because they walk the talk. They don't try to "fix" anyone. They take care of themselves holistically and so they are the antidote. They heal themselves and in that process an entire community experiences the benefits of this healing. We have worked with the Law of Attraction long enough to know that what we think about we become, yet that does not mean that we can sidestep our deep-seated wounds through positive thinking alone. We must let the positivity influence our ability to positively process our pain, and allow it to be transformed, leading us to our legacy. I couldn't be more excited and honored to be a part of the People Shine Project. It is my dream that alliances like this will spring up everywhere." "For me, it all began just 0ver a year and a half ago when I was emotionally and spiritually broken. I wanted to learn about meditation and was told of a group that met on Wednesday evenings at the Church of Spiritual Light. I went, not understanding anything, and could not stop going back! I had an experience that has not stopped...it's called enlightenment and a better understanding of this GOD in my life. So many doors have opened for me to learn through my association with those at the Church of Spiritual Light. Rev. Renee Bledsoe has not only become an important "Teacher" in my life, but a most beloved friend. The whole community of people there have greeted me with open arms and shared all their knowledge! From the meditation group to Sunday services, to Kabbalah class, to yoga, and one of my favorites, Addiction Alchemy Medicine Wheel, there is a multitude of ways to explore our purpose here on earth and strengthen our connection with God! My life has been on a fast track of learning and the excitement is beyond my wildest dreams!!! I thank God every day for redirecting my life to the search that brought me to this community, to my beloved friends at the Church of Spiritual Light. Even in the midst of some very sad experiences I see Gods' purposes and lifes' lessons which only help me on my souls' journey. 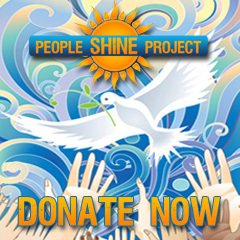 Thank you Renee and all associated with everything at the Church of Spiritual Light and the People Shine Project."